GOLD COAST INVESTOR CASHES IN THEIR CHIPS! Be quick with this unit in a low maintenance complex & currently rented at $450/week..sensational returns..what an opportunity! 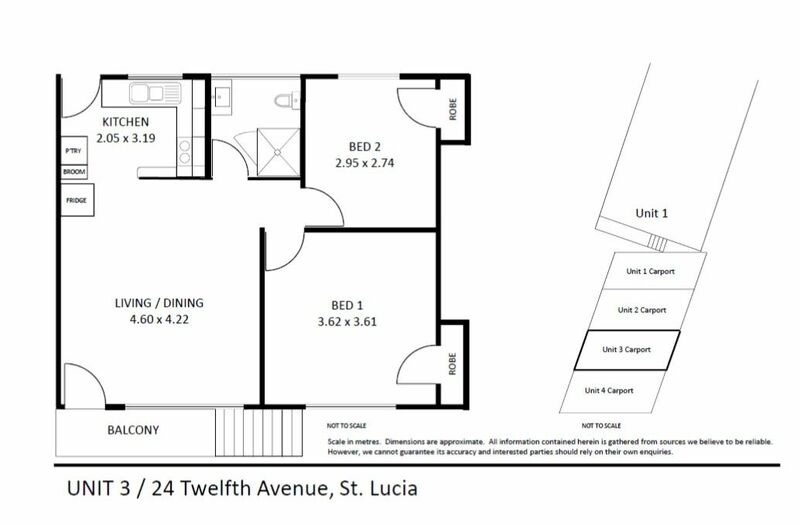 It’s a neat & tidy two bedroom unit with a great leafy aspect & smart practical layout. The near new kitchen and bathroom present beautifully. Currently rented at with a solid holding income until your son or daughter kicks off their studies at UQ next year or perhaps continue to collect the rent into the future? The choice is yours! One of only 4 in the block, gives the new owner the confidence around their solid new home. Large windows and built in robes, private stair access, well-sized bathroom, are among some of the stand out features. The property has a very homely feel and you will love it the moment you inspect! The location is fantastic, only a stones throw to UQ and surrounded by all the benefits of St Lucia living with bus connections in all directions (from Carmody Road) 1minute walk away, the City-Cat service only a nine minute walk away & only moments from Indooroopilly & Toowong Shopping town or perhaps into UQ for the afternoon.